Posted on April 26, 2016 at 11:04 am. 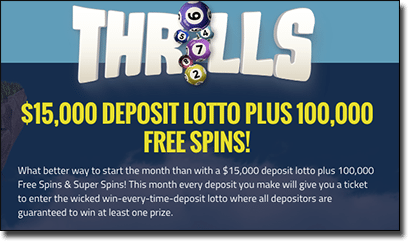 Running until Sunday May 1, every player new and loyal will earn a ticket into the $15,000 lottery when they make a deposit at Thrills.com, followed by a guaranteed share of the 25,000 Free or Super Spins. With just one qualifying period left (from four), there’s still time to win. Simply make a deposit and wager it before May 1 at 23:59 CET – be sure to look up time differences in order to qualify. Every real money deposit you make and bet with will earn you a ticket, with all deposits made from April 4 counted towards this draw – so you may already be in the running. If you don’t score cash you will still score a prize, with guaranteed Free or Super Spins awarded to your account the following Monday after the completion of the promotional period. What’s more, if you need something to wager your deposit on, the new NetEnt Jimi Hendrix online pokie has arrived at Thrills.com. Net Entertainment announced the release of a new rock n’ roll pokie to follow on from Guns N’ Roses at the ICE Totally Gaming Conference this year, and now it has finally arrived. Despite being the second instalment of the trilogy of rock pokies – A Motorhead pokie will be released in September – the Jimi Hendrix pokie doesn’t have all the bells and whistles Guns N’ Roses had. For starters, it’s missing the unique set list option where you can choose which track you want to listen to while spinning the reels. Nevertheless, the 5 reels and 20 paylines pokie, based on the iconic musician Jimi Hendrix, still offers a whole heap of features – six to be exact – and his music is played in the background (we just can’t pick what track). There are two features in the base game including the Purple Haze feature where you get extra Wilds, as well as the Red Guitar Re-Spin where you can trigger a free re-spin. Then there are three Free Spins features including the Crosstown Traffic Free Spins feature, the Purple Haze Free Spins feature, and the Little Wings Free Spins feature, with the Little Wings feature offering the highest number of free spins – up to 12 with extra Wilds. Finally, there’s the Pick and Click Me feature, which sees four different prizes to choose from including activating one of the Free Spins features or a Coin Win feature. Deposit and play your favourite real money games at Thrills.com, all the while earning a cash prize or free spins.